The Sustainable Design Research Centre (SDRC) is pleased to announce the addition of new commissioned experimental resources to its lab. The new equipment will be used for both research and education purposes, including a PhD in Renewable Technology (Heat Transfer and Thermodynamic Expansion), two further PhD research projects and one Research Assistant within SDRC (Dr Zulfiqar Khan, PI). All this research informs education within the Design & Engineering Framework, MEng Programme, through Level I Thermo-fluids & Heat Transfer (20 Credit) unit led by Dr Zulfiqar Khan. The equipment is a significant new addition and will enhance students’ experience and provide a vehicle for realising BU’s Fusion initiative. The experimentation stand can be used to investigate pipe frictional losses with laminar and turbulent flows. The pipe section is a brass pipe with an internal diameter of 3 mm. The distance between the pressure measuring fittings and thus the length of the experimental pipe section is 400 mm. The pressure losses for laminar flow are measured using a water manometer. The static pressure difference is displayed. A head tank is available to create a laminar flow and ensures a constant water inlet pressure in the pipe section at a constant water level. For turbulent flow, the pressure difference is measured using a dial manometer. The head tank is not used to create a turbulent flow. The water is fed directly into the pipe section from the water supply via a bypass. The flow is adjusted using shut-off valves at the beginning and end of the pipe. The water supply is provided either by the Basic Hydraulics Module or from the mains supply in the laboratory. The equipment is used to investigate Bernoulli’s law. The measurement object is a Venturi nozzle with six pressure measurement points. 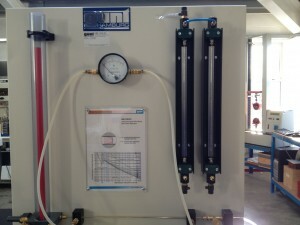 The six static pressures are displayed on a board with six water pressure gauges. The overall pressure can also be measured at various locations in the Venturi nozzle and indicated on a second water pressure gauge. Measurement is by way of a probe which can be moved axially with respect to the Venturi nozzle. The probe is sealed by way of a compression gland. 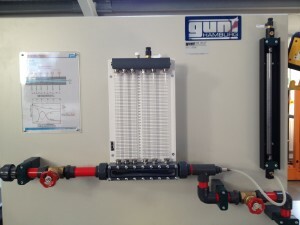 Water is supplied either from the Fluid Mechanics Basic Module or from the laboratory mains. The equipment enables a closed water circuit to be constructed. The above information is provided by GUNT Publication-no. : 917.000 01 A 150 12 (A) Experiment instructions HM 150.01 Pipe Friction Apparatus & Experiment Instructions HM 150.07 Bernoulli’s Principle Demonstrator. If you have interest in Renewable Technology research and education and would like to find more about the activities within the Sustainable Design Research Centre, then please contact Dr Zulfiqar Khan (Associate Professor), Director of the SDRC.